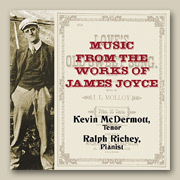 All of the songs listed below have been performed and recorded by Kevin McDermott and Ralph Richey and are included on our first CD, Music from the Works of James Joyce, issued by Sunphone Records in 2003 and available here for sale. This section of the site provides lyrics, information on the composers, and discussions of the literary context of the songs on this CD. Also featured on these pages are music clips from each of the songs on the CD (Flash plug-in required). To listen to the clips from the entire CD all at once, please visit our Preview page. You can also view this list reorganized with the songs grouped according to each title of Joyce's works where they are cited.